Making weapons, utensils, or other camp items such as fire tongs can be made improved by having a hank of cordage. With either 550 cord or bank line, you have a fishing line you can use to get yourself calories. Both 550 cord and bank line are also good for making primitive traps. I prefer to use bank line as it is very strong and holds a knot better. 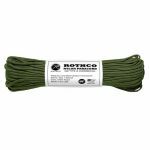 You'll also find snare wire which is excellent for trapping small game. 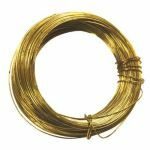 A squirrel pole can be made using this brass wire. Squirrels will take the easiest route to getting up a tree and if you have a pole leaned up against their tree, they will usually take the route.